McCormick Tract - What is it? The purpose of this report is fourfold. 1. To provide a source of reference for the McCormick Tract. 2. To briefly describe the history of the area. 3. To document the condition of the area through photos. 4. 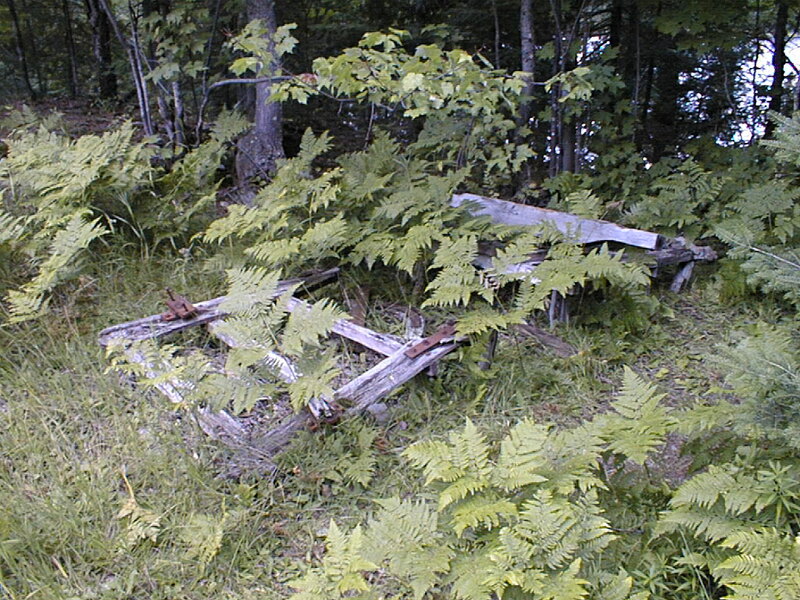 Show what the area looked like before the cabins were removed. Three sources were used for the information. The first is a web address referenced at the beginning of the introduction. The other two publications are referenced at the end of the historical section. The historical section is very brief with most detail going to the early years. 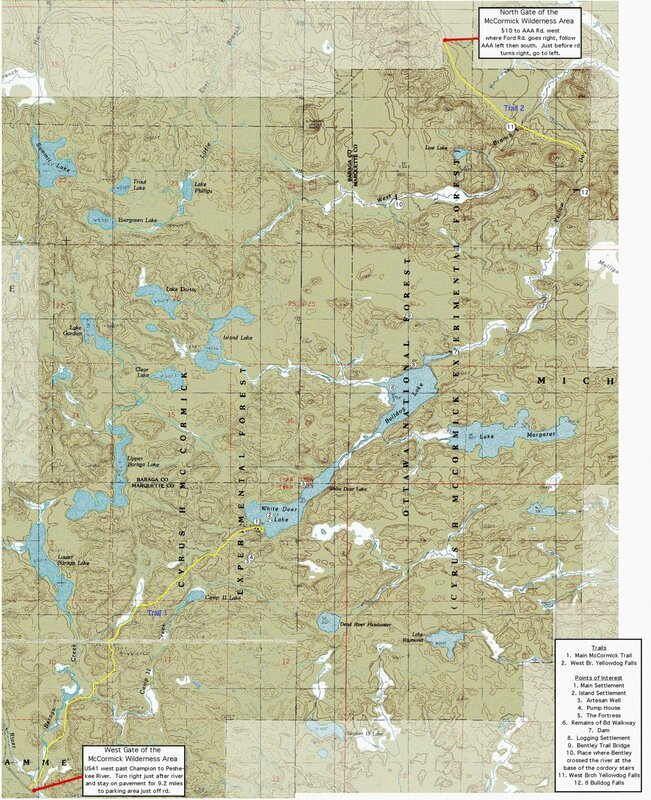 A Topo map of the McCormick Tract containing trail indications, directions, and references to photos taken in 1998 and 1999 by the author is included in the Maps page. The Photos page contain several photos which are identified by numbers corresponding to those on the topo map. Also included is a map of a route into the north end of Bulldog Lake. It is not a trail but a route developed by the author to provide the easiest access to this area. I have this loaded into a GPS and usually follow it to point Bent1. This is where the Bentley trail becomes obvious and is very easy to follow. From this point it is about 1.25 miles to the logging camp site on Bulldog Lake as seen in Photo 8. This route is the same distance as the trail into White Deer Lake, about 3.2 miles. The area is not only interesting because of its history and the structures which remain today, but also because of the many things that can be found by simply walking through these woods. I have found old barrels, wooden bridges, horse drawn sleds, old roads, trails and tree blazes. The object which I find most interesting is the structure built around their primary water source, an artesian well. 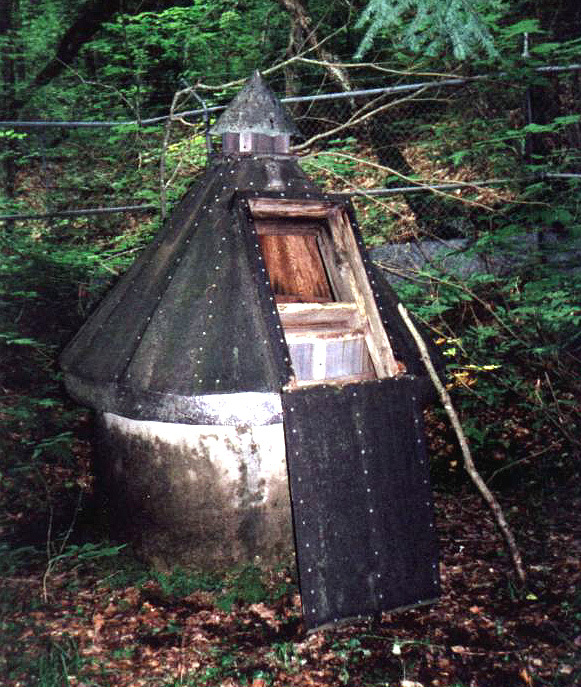 The structure around the well is shown in the photo. This is inside a chain link fence circled with barbed wire running around the top, most likely to keep the animals out of their water supply. Any comments, suggestions or other interesting finds in this area could be relayed to the author. "Located in the Ottawa National Forest in Michigan. 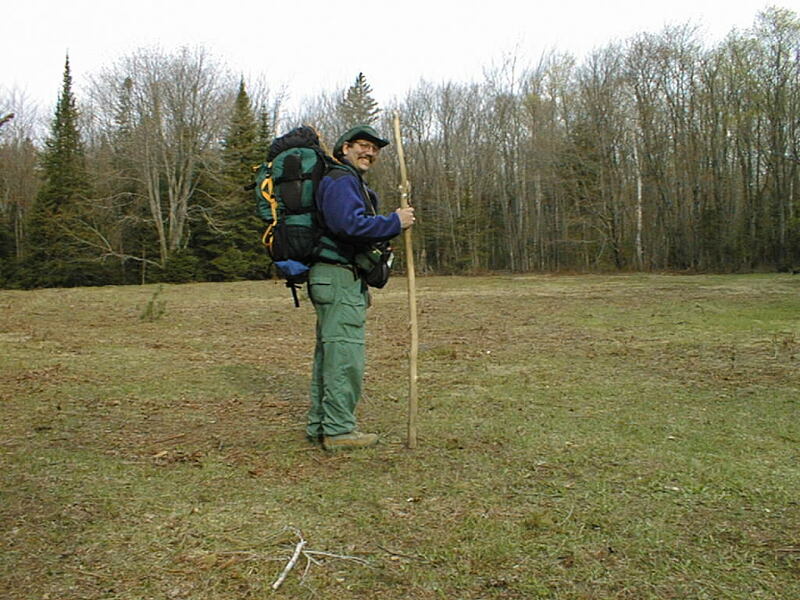 The McCormick Wilderness is located in the north-central part of Michigan's Upper Peninsula, about 35 miles east of the main body of the Ottawa National Forest in Baraga and Marquette counties. The area is 12 miles north of Champion and 50 miles west of Marquette on US Highway 41. Access to the southwest corner of the wilderness is by County Road 607, an old Huron Bay railroad grade. McCormick Wilderness includes 16,850 acres, or about 27 square miles of forested land and small scattered lakes. The area also contains the 3675 acre McCormick Research Natural Area designated in 1971, and the Yellow Dog National Wild and Scenic River. The lay of the land at McCormick is varied, ranging from nearly level to rocky cliffs and outcrops. The area straddles the divide between the Lake Superior and Lake Michigan watersheds and the Huron, Yellow Dog, Dead and Peshekee rivers all have part of their head waters here. Eighteen small lakes lie sparkling on the landscape. Numerous swamps and muskegs rim the area's waterways. In one respect McCormick's lakes and streams seem a little out of place -- they more closely resemble waters found further north on the Canadian Shield rather than the more fertile water of the "UP", and game fish populations are low as a result. The glacier-scoured hills of McCormick Wilderness are covered with a mixture of northern hardwood and lowland conifer forests that reclaimed the land after the logging era of the early 1900's. The trees in the area have been undisturbed for at least 70 years. Small patches of towering ,white pine, Michigan's State tree, are scattered among rugged rock outcrops, lakes and streams, and remind us how these woods looked before European settlement. Animals that live in the area are typical of northern Lake States forest and include white-tailed deer, black bear, otter, fox, mink, squirrels, and snowshoe hare. Bird watchers will find a variety of feathered friends including the loon and pileated woodpecker. Active and abandoned beaver dams are evident on most of McCormick's waterways. Visitors are more likely to see moose and pine martin here than in many other places on the Ottawa due to reintroduction programs. Small populations of large mouth bass, northern pike and trout live in the area's network of lakes and streams. The tract was used as a vacation retreat and protected over the years by three generations of McCormick's, descendants of Cyrus H. McCormick, inventor of the reaping machine. The last owner, Gordon McCormick, donated the family estate to the USDA-Forest Service upon his death in 1967. Because of its unique characteristics and setting, it became part of the National Wilderness Preservation System when the President signed the Michigan Wilderness Act in December 1987. Access to the interior of McCormick Wilderness is limited. A 3 mile foot trail connects County Road 607 with White Deer Lake where the McCormick estate buildings once stood, but these have since been removed and only the foundations remain. The rugged McCormick Wilderness has much to offer outdoor enthusiasts who prefer to hike, backpack, fish, hunt, camp, cross-country ski or snowshoe in a remote undisturbed wooded setting. Canoeing opportunities are limited by lengthy portages between lake s. Cross-country skiing is limited by snow depths and access from County Road 607 which is not always plowed. The major attractions of the McCormick Wilderness are the waterfalls on the Yellow Dog River, the undisturbed large, aging mixture of northern hardwood trees, the overall rugged, isolated, unspoiled character of the area, and the chance it provides to see native species in their natural habitat. McCormick's exceptional natural appearance and feeling of solitude it provides demand our attention and care."